"You can't compare apples with oranges"
I don't really understand this poster. 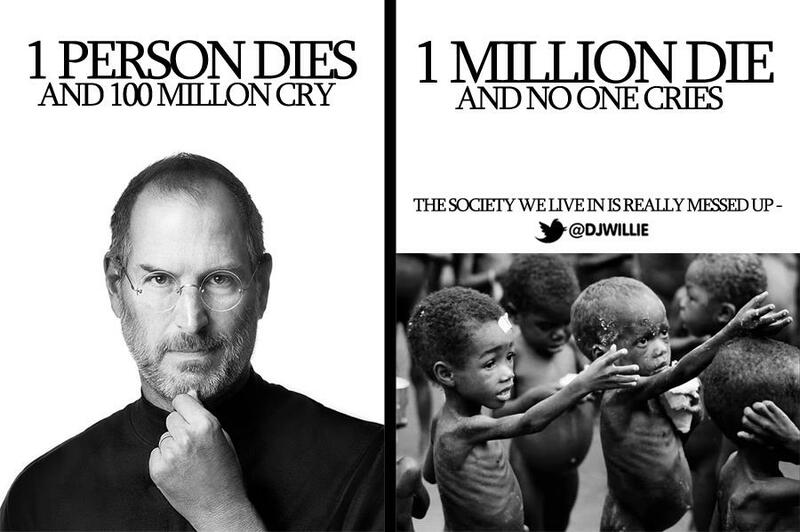 How can someone compare a man like Steve Jobs with some random dying people... If you want to do that, then nobody is great and worthy of looking up to. People die everyday. And those people are somebody really great to their family and close ones, but to the rest of the world, they are nobodies. However, once in a while, some people who touch the lives of lakhs of people come around. These people end up being role models to a lot of people. Steve Jobs may not have fed hungry African children, but his achievements, ups and downs, and vision have inspired lakhs of techies and students. If you want to compare a great like Jobs to a hungry kid in Africa, then you will have to erase the very concept of great people and say that every man is equal. Nobody's achievement means anything anymore, because, just because Gandhi got independence to India, doesn't get independence to people in China who are stuck without rights or the harassed people in Myanmar, and just because there are people who have no legs, doesn't make feats of Usain Bolt or Michael Phelps something not worth marvelling. According to me this poster just dont compares Steve Jobs death and "random dying" people.This shows how we give ultimate importance to death of Steve Jobs and show ignorance about African children.People spend hell lot of money to buy Apple products but some of them even dont know the situation in Africa.. I know you and I cant change anything but if number of people who have sent condolence to Steve's death on FB wall donate atleast 0.1% of what they earn to dying children then we can see some relief in Africa.